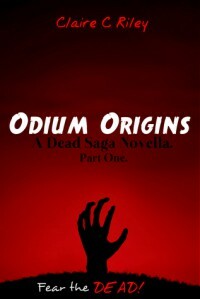 Odium Origins is a companion novel to Odium, and gives us a peek into the world of our favorite - and not so favorite - characters when the plague that turned people into flesh-craving undead monsters spread. I think I understand the characters better now, and even changed my opinion of some of them. Take Crunch, for example. I was happy to sneer at her during her interactions with Nina in Odium, but after getting a glimpse into her crappy life before all hell broke loose, I actually had sympathy for her. Which caused conflicting emotions in me, because I didn't want to feel sorry for her. But that all changed. Now I understand why she is who she is. We learn how Crunch meets Mikey, and how the two of them run into Duncan. This is another character whose back story changed my feelings. Instead of feeling sorry for him, like I did originally, I found I actually despised him. Duncan truly is a coward. J.D. 's story is one who resonated most strongly with me, simply because I am a parent, like he was. I actually sobbed reading how Amy and poor little Ben were trapped and J.D. could do nothing to save them. But he didn't give up, and for that he has my respect. If that happened to my family, I don't think I would be able to exist without them, without that part of my heart, my soul. I love this novella, and for zombie fans, you really should make this part of your collection, too.